48h before arrival. In case of a late cancellation or No Show, you will be charged the first night of your stay. 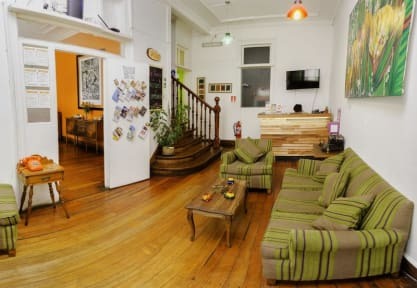 We are the first Eco Hostel in Valparaiso!!! We reduced by 5% our carbon footprint in 2015, therefore we received an International Sustainability Certification. YES WE CAN! We recycle, we do compost with our organic wastes, we heat up our bathwater with solar panels and we incentive local production. The environment is important to us, and so are our guests. Which is why we provide a high level of customer service, recognized as one of the best in town. Our staff is multilingual and ready to meet the needs of travelers and point out the best places of Valparaiso. Nómada Eco-Hostel is in a 100 years-old house, built in ecltic style. We have five bedrooms, four bathrooms, a fully equipped kitchen, a dining room and a lovely terrace. This is where guests can sit down to relax, enjoy our famous barbecues, and take in our art exhibits and concerts. In such occasions the true nature of our hostel flourishes with great experiences, new friends, and amazing stories. Super great hostel! Personnel was really nice and helpful and breakfast jummie! They organized an argentinian bbq when we where there so great to meet people. Only downside: our room had no fresh air. Sweet hostel with awesome people, beds really need improvement, feels like sleeping on plastic... Besides that, really great (eco) hostel!! This is an okay place. Staff was a bit indifferent at times and not always very cheerful or welcoming. Why work in a hostel if you can't put a smile on your face every now and then? It's a bit of a walk from the centre but it has comfortable rooms and an okay equipped kitchen. The terrace is nice too and it's good that they're making an effort by trying to be an eco-hostel. I wouldn't advise against staying here but just check out other places too. The staff seemed to care more about having a good time theirselves then taking care of their guests. A lot of friends and non-guests of the staff would hang around the hostel all day having private parties. It sometimes felt as if you were bothering them when you would use the common areas. The beds were comfy though and the breakfast was nice.